You all have heard the saying “Curiosity killed the cat, but satisfaction brought him back.” I’m certain that we were all born explorers and many of us decide to make that a life long career out of it. Sometimes our exploration can cause major pitfalls too which can then spiral downhill and bring greater grief to our lives. In my mind a horror story is unfolding and am terrified to go check out the scene. But after calming her down we began the journey to see how much damage was done. Once outside, I found the little fellow and took him back to the barn. Allison followed me inside while still crying about what taken place. I then turned to her and kneeled down on the floor with the little duck in my hands. “Honey, mom is not mad. I’m very thankful that you were brave enough to tell me the truth. Now that you told me what happened we can take care of the problem and it is all going to be o.k.” I explained sweetly. Then we began to talk further about how we are to be careful when exploring and how easy it is to hurt God’s little creatures even if we were not meaning to do so. Of course I also gave her reassurance about the importance of always coming to me and telling me things that scare her or what she may have done wrong. As for the little duck, after a sweet prayer of healing he went back to the warmer with food and water and this morning he was found completely recovered after being traumatized. A little while longer Allison comes back to me crying and said “Momma, please don’t be upset… I didn’t mean to do it!” Hummmm…. another duck incident perhaps? Questions begin to start in my mind. 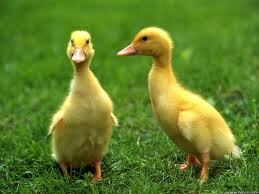 But to my very surprise after she starts talking I realize she is re-asking me for forgiveness about the little duck. Honestly I had already forgot about it (so to speak) and moved on to bigger issues with my other daughter. I believe the Lord allowed this to happen to teach me a little life lesson about forgiveness from above. Isn’t it true when we commit a sin that often times rather than to go to God and talk it over we will try to hide what we did from the Lord? It reminds me of the story of Adam and Eve. But later whenever our conscience will no longer let us live with ourselves, and the burden gets too hard for us to carry on our own, it is at that time we decide to cry out to the Lord. We only hurt ourselves when we wait and spend time with the misery of trying to hide anything from him. Since he is omnipotent it is pretty much a given that he already knows what you did anyway. My mother always told us as kids that she had eyes in the back of her head and figured that if she gave us long enough we would tell on ourselves anyway. Even after going to the Lord often times I find myself going back to him re-living the sin over again and re-confession what he had already cast out in the sea of forgetfulness and in his word we should be reassured that he remembers it no more. But the enemy will not forget and he would love nothing more than to destroy someone by their thoughts and make them feel like they are unworthy or their sin was too great to forgive so easily. We battle the enemy in our minds. Take good heart that “God is Love.” He is a forgiver wants us to run to him with everything while he stands with open arms.